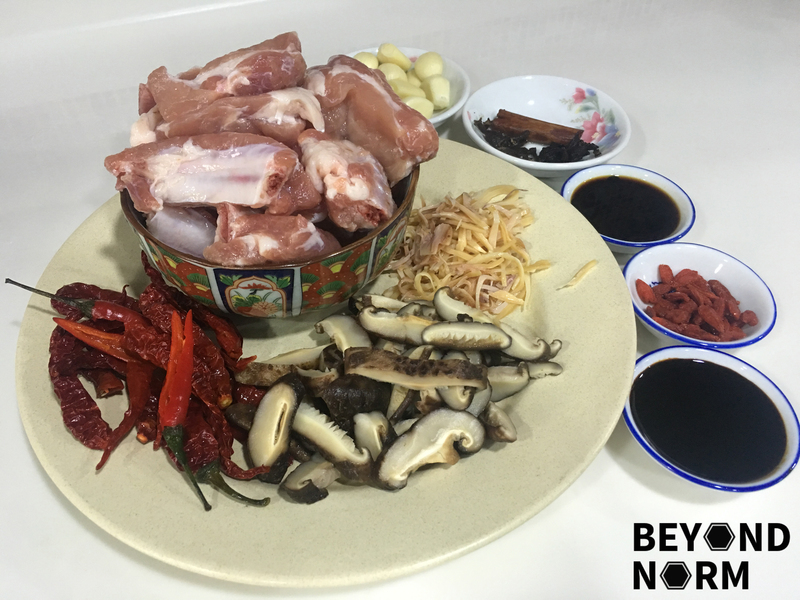 Bak Kut Teh (BKT) in Hokkien (a Chinese dialect) literally means Pork Rib Tea. When I was a child, my mum would cook this herbal soup using the herbs/spices from the Chinese medical shop. Nowadays, most grocery stores and supermarkets in Malaysia and Singapore carry the sachets which contains the powdered herbal mix ready to be used. Being a strong advocate of healthy eating, I still prefer to use the loose herbs mix in this dry BKT dish. Reason? I once bought a packet of ready to cook BKT sachet and realised that there were preservatives in it. How disappointing! Klang town in Malaysia is famous for its BKT in soup form. Some years ago a dry version originated from this town and is now not only popular around Malaysia but also in Singapore. The BKT soup is dark and strong (with spices and herbs) in Malaysia whereas the soup is pale and peppery in Singapore. 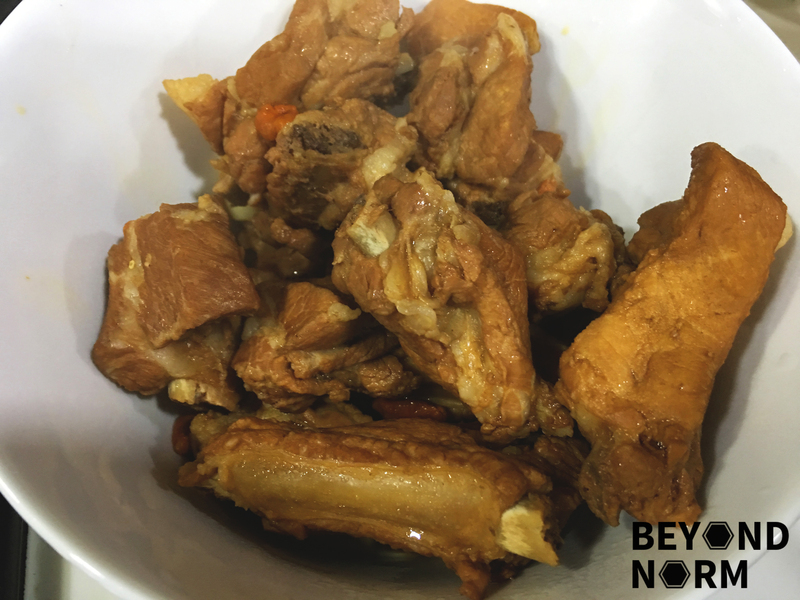 My family and I love the strong and robust flavours in this dry version; the additional ingredients are fried dried cuttlefish, mushrooms and the chillies which gives it an oomph to our palate!! Add the water into a pot and bring it to a boil. 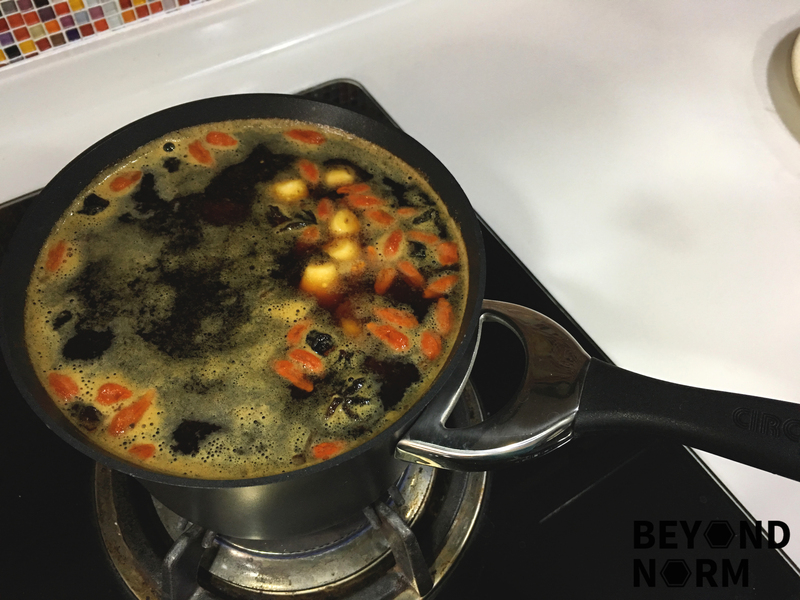 Add in the aniseeds, cloves and cinnamon stick into the boiling water. Add in the pork, garlic, wolfberries, dark soy sauce, and light soy sauce. Simmer in low heat for 45 minutes. 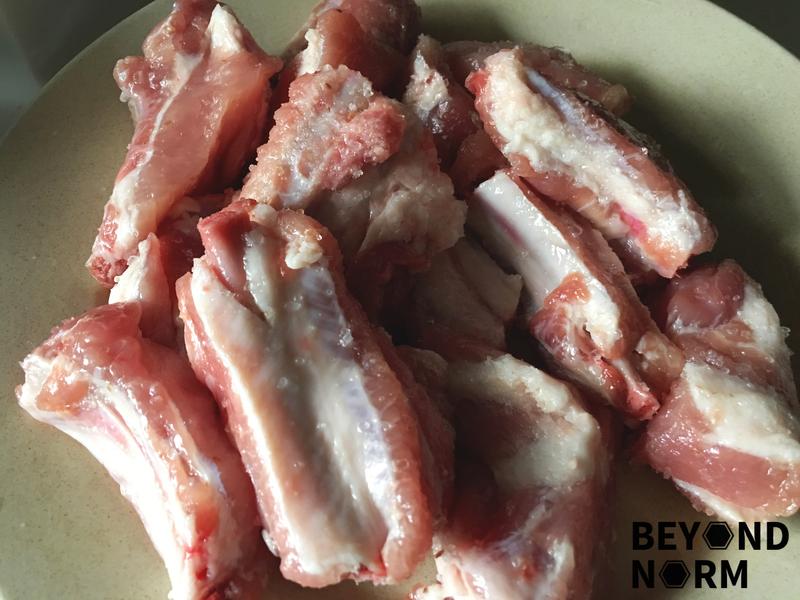 Remove the pork from the broth and set aside. Keep the broth for later use. Then add the dried chillies, and chili padi until fragrant. 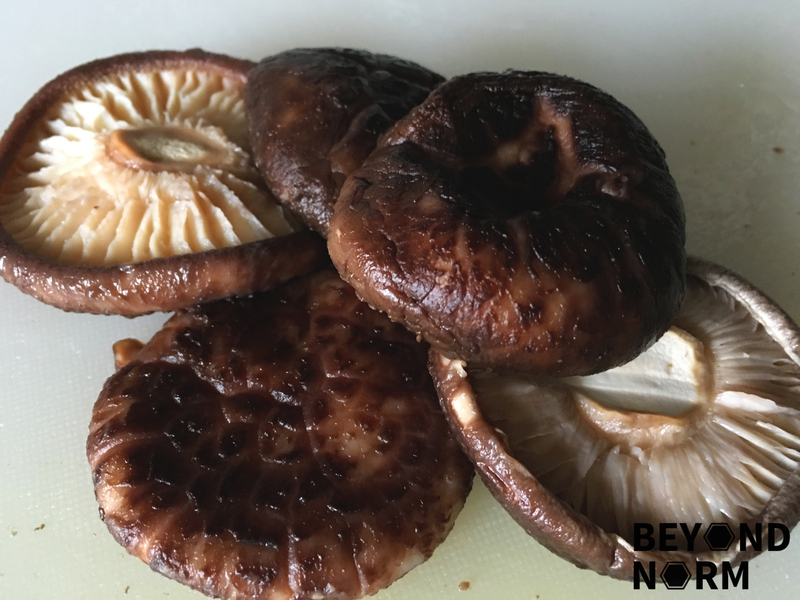 Add in the mushrooms and stir for another minute. Add in the ladies’ finger and fry 30 seconds. Add in the pork (from Step 6). Fry for 2 minutes. 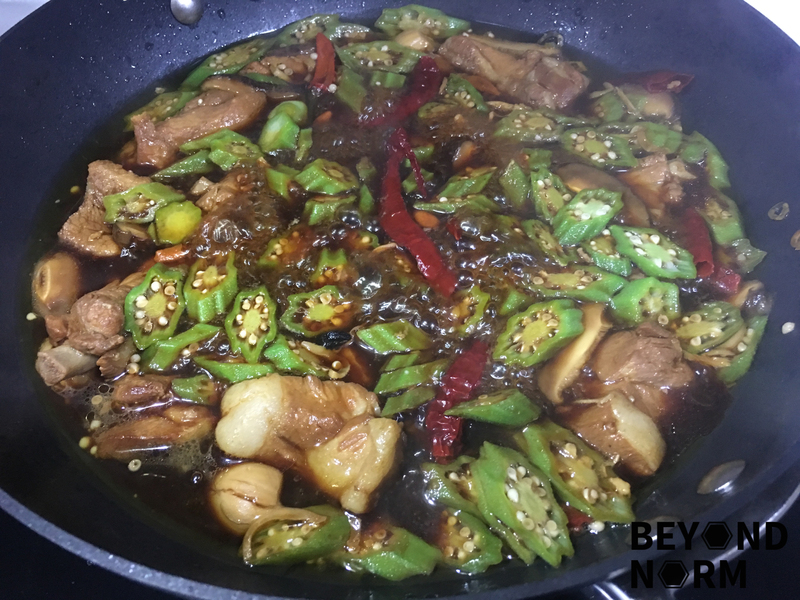 Adjust the taste by adding in the light soy sauce, dark soy sauce, and oyster sauce. Bring it to a boil. Simmer until the gravy is reduced to the consistency which you like. When it is ready to serve, garnish it with the chopped coriander. Goes well with steamed rice. If you want your dry BKT to be spicier, you can cut some of the dry chilli into half. I used only the basic herbs/spices for this dish. If you prefer a firmer texture for the ladies’ finger/okra, add them in in at Step 14 halfway through the simmer.